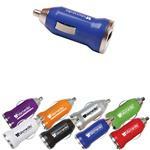 This handy custom dual USB car charger plugs into any standard cigarette lighter to power up your mobile devices. The charger features 2 USB ports with 1 and 2.1 Amp output. Keep your phone charged while using your Bluetooth device so that your calls are never cut short. 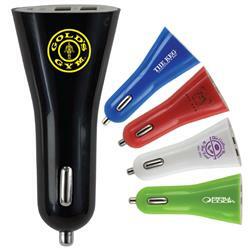 One of our favorite custom USB car chargers! A great tradeshow giveaway! Production Times Available: 5-7 working days. Inquire for rush. The charger features 2 USB ports with 1 and 2.1 Amp output. DC to USB.